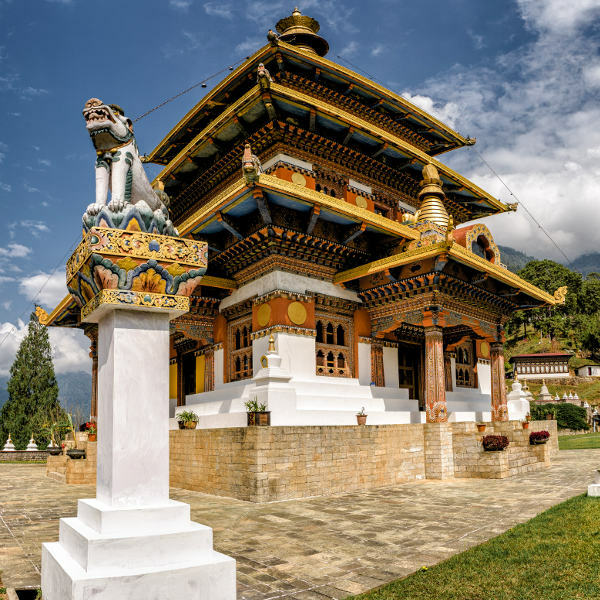 Bhutan is an ethereal place where Buddhist monks and enchanting festivals fill the streets and ancient dzongs and monasteries wrap around majestic mountains. With over 800,000 residents, Bhutan is the second-least populous nation in South Asia. Popular attractions include the Taktsang Monastery in Paro, Punakha Dzong in Punakha, and the Buddha Dordenma Statue in Thimphu. Get ready to experience the mystical magic of the last great Himalayan kingdom with cheap flights to Bhutan. Bhutan is home to Paro Airport (PBH), which is a 1 hour and 9-minute drive from the capital city, Thimphu. Bhutan is famous for its beautiful dzongs and sacred monasteries. Taktsang Monastery is famously built on the side of a vertical cliff and shrouded in legend, while Punakha Dzong dates back to 1638. 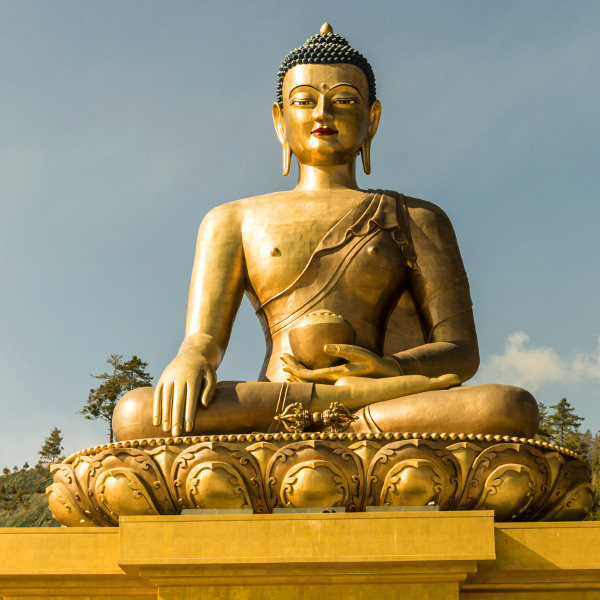 Buddhism is finely woven into the lives of the Bhutanese. Young monks in maroon robes, prayer flags, ornate dzongs, and sacred mantras carved into hillsides are everyday sights in Bhutan. Many of the festivals celebrate Guru Rinpoche, the Tantric master who introduced Buddhism to Bhutan in the 8th century. Expect mysterious naked dances, fire performances, and colourful traditional masks. The climate of Bhutan varies according to region. The climate of Southern Bhutan is hot and sub-tropical and remains relatively unchanged throughout the year, while Central Bhutan is cooler, with warm summers and dry winters. Northern Bhutan is famous for its snowy peaks. The most popular times to visit Bhutan are the spring season (March to May) and autumn season (September to November). 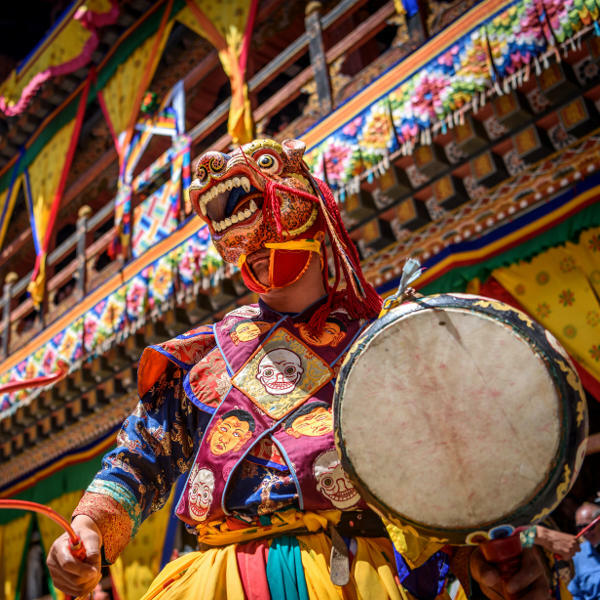 These months offer lovely weather and mesmerising events such as the Jambay Lhakhang Drup Festival and the Punakha Drubchen and Tshechu Festival. If you want to witness beautiful Himalayan vistas and experience excellent hiking in the valley, the winter months (December to March) are a great time to visit Bhutan. However, for cheap flights to Bhutan, the best time to visit is between June and September. Situated on the eastern slopes of the Himalayas lies Bhutan: the land of happiness. Its Bhutanese name is Druk Yul, which means “Land of the Thunder Dragon”. Famous for its traditional Buddhist culture, sacred monasteries, and magical mountains, Bhutan is the last great Himalayan kingdom. It is considered the last country in Asia where you can still experience authentic culture. Bhutan is a place where traditions are fiercely guarded and tourism is carefully regulated to preserve the environment and delicate culture. Only a handful of pilots in the world are certified to land at Paro International Airport and travellers can only visit the country on pre-arranged tours through a licensed travel agency. Bhutan is the ultimate off-the-beaten-track destination. It is a place where the people live in harmony with their environment (plastic bags and cigarettes are banned) and spirituality hangs heavily in the air. Monks crossing cobbled courtyards, colourful buddhist prayer flags, and ornate monasteries are everyday sights. If you want to trek up magical mountains, learn about Buddhism, eat ridiculous amounts of chilli and cheese, and witness enchanting festivals, then Bhutan is the country for you. Visiting this little country is a deeply spiritual experience that will stir your soul and linger on your skin long after you have left. Compare several airlines and book your cheap flights to Bhutan online at Travelstart! Bhutan is a safe country. The only issues you might encounter are heavy monsoon rains from June to September. Earthquakes are also a risk, as several parts of the country lie on active fault lines. Local customs and traditions are taken very seriously and should be respected at all times. It is highly recommended that you familiarise yourself with the local laws and customs before arriving in Bhutan. Travel insurance to cover theft and medical expenses is recommended. Altitude sickness can pose a risk if you plan on trekking through the high mountains. A yellow fever vaccination certificate is required if you are travelling from an infected area. Malaria, dengue fever and Japanese Encephalitis are a risk in Bhutan, so precautions should be taken to prevent mosquito bites. Immunisation against the following is also recommended: hepatitis A & B, typhoid, rabies, MMR, diphtheria-tetanus-pertussis, meningitis, varicella, polio and influenza.